Do not remove the radiator cap when the engine is hot. Serious burns could occur from high pressure engine coolant escaping from the radiator. Wrap a thick cloth around the cap. Slowly push down and turn it a quarter turn to allow built-up pressure to escape. Carefully remove the cap by pushing down and turning it all the way. Check if the reservoir tank engine coolant level is within MIN to MAX when the engine is cool. Adjust engine coolant level if it is too much or too little. 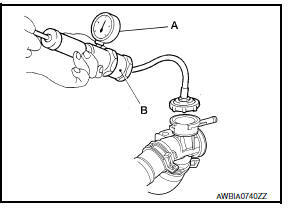 To check for leaks, apply pressure to the cooling system using suitable tool (A) and Tool (B). Testing pressure : Refer to CO-28, "Radiator". Higher pressure than specified may cause radiator damage. Replace the cap if the metal plunger cannot be seen around the edge of the black rubber gasket. Replace the cap if deposits of waxy residue or other foreign material are on the black rubber gasket or the metal retainer. Thoroughly wipe out the radiator filler neck to remove any waxy residue or foreign material. Pull the negative-pressure valve to open it and check that it closes completely when released. Check that there is no dirt or damage on the valve seat of the radiator cap negative-pressure valve. Check that there are no abnormalities in the opening and closing conditions of the negative-pressure valve. Negative pressure: Refer to CO-28, "Radiator". Check radiator cap relief pressure using suitable tool and Tool. Positive pressure (relief): Refer to CO-28, "Radiator". 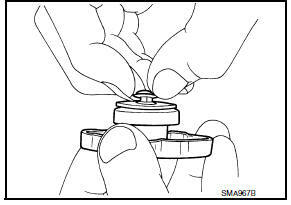 When connecting the radiator cap to the tester, apply water or engine coolant to the cap seal surface. Replace the radiator cap if there is an abnormality in the negative- pressure valve, or if the open-valve pressure is outside of the standard values. Check radiator for mud or clogging. If necessary, clean radiator as follows. Be careful not to bend or damage the radiator fins. 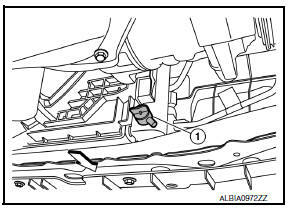 When radiator is cleaned on-vehicle, remove surrounding parts in order to access the radiator core. Tape the harness and harness connectors to prevent water from entering. Spray water to the back side of the radiator core using a side to side motion from the top down. Stop spraying when debris no longer flows from radiator core. Blow air into the back side of radiator core using a side to side motion from the top down. Use compressed air lower than 490 kPa (5 kg/cm2, 71 psi) and keep distance more than 30 cm (11.8 in). Continue to blow air until no water sprays out. Check for engine coolant leaks. Repair as necessary. To avoid being scalded, do not change the engine coolant when the engine is hot. Wrap a thick cloth around cap and carefully remove the cap. First, turn the cap a quarter of a turn to release built-up pressure. Then push down and turn the cap all the way to remove. Remove the engine under cover. Refer to EXT-16, "Exploded View". Open the radiator drain plug (1) at the bottom of the radiator and remove the radiator filler cap. This is the only step required when partially draining the cooling system (radiator only). Do not spill engine coolant on the drive belt. Perform this step when the engine is cold. Follow this step for heater core removal/replacement only. Disconnect the upper heater hose at the engine side and apply moderate air pressure [103.46 kPa (1.055 kg/cm2, 15 psi) maximum air pressure] into the hose for 30 seconds to blow the excess engine coolant out of the heater core. When draining all of the engine coolant in the system, remove the reservoir tank and drain the engine coolant, then clean the reservoir tank before installation. Do not allow the engine coolant to contact the drive belt. Perform this step when engine is cold. When draining all of the engine coolant in the system for engine removal or repair, remove the engine coolant drain plugs on the cylinder block. Check the drained engine coolant for contaminants such as rust, corrosion or discoloration. If the engine coolant is contaminated, flush the engine cooling system. Install the radiator drain plug. Install the reservoir tank and cylinder block drain plug, if removed for a total system drain or for engine removal or repair. The radiator must be completely empty of engine coolant and water. Apply sealant to the threads of the cylinder block drain plug. Use Genuine High Performance Thread Sealant or equivalent. Refer to MA-11, "Fluids and Lubricants". Radiator drain plug : Refer to CO-15, "Exploded View". If disconnected, reattach the upper radiator hose at the engine side. Set the vehicle heater controls to the full HOT and heater ON position. Turn the vehicle ignition ON with the engine OFF as necessary to activate the heater mode. Install the Tool by installing the radiator cap adapter onto the radiator neck opening. Then attach the gauge body assembly with the refill tube and the venturi assembly to the radiator cap adapter. Insert the refill hose into the engine coolant mixture container that is placed at floor level. Make sure the ball valve is in the closed position. Use recommended engine coolant or equivalent. Refer to MA-11, "Fluids and Lubricants". Engine coolant capacity (with reservoir tank) : Refer to CO-28, "Periodical Maintenance Specification". Do not use any cooling system additives such as radiator sealer. Additives may clog the cooling system and cause damage to the engine, transmission and/or cooling system. Install an air hose to the venturi assembly, the air pressure must be within specification. The compressed air supply must be equipped with an air dryer. The vacuum gauge will begin to rise and there will be an audible hissing noise. During this process open the ball valve on the refill hose slightly. Engine coolant will be visible rising in the refill hose. Once the refill hose is full of engine coolant, close the ball valve. This will purge any air trapped in the refill hose. Continue to draw the vacuum until the gauge reaches 28 inches of vacuum. The gauge may not reach 28 inches in high altitude locations, use the vacuum specifications based on the altitude above sea level. When the vacuum gauge has reached the specified amount, disconnect the air hose and wait 20 seconds to see if the system loses any vacuum. If the vacuum level drops, perform any necessary repairs to the system and repeat steps 6 - 8 to bring the vacuum to the specified amount. Recheck for any leaks. Place the engine coolant container (with the refill hose inserted) at the same level as the top of the radiator. Then open the ball valve on the refill hose so the engine coolant will be drawn up to fill the cooling system. The cooling system is full when the vacuum gauge reads zero. Do not allow the engine coolant container to get too low when filling, to avoid air from being drawn into the cooling system. Remove the Tool from the radiator neck opening. Fill the cooling system reservoir tank to the specified level and install the radiator cap. Run the engine to warm up the cooling system and top up the system as necessary. Install the engine under cover. Refer to EXT-16, "Exploded View". Fill the radiator from the filler neck above the radiator upper hose and reservoir tank with clean water and reinstall the radiator filler cap. Run the engine until it reaches normal operating temperature. Rev the engine two or three times under no-load. Stop the engine and wait until it cools down. Drain the water from the system. Refer to CO-12, "Changing Engine Coolant". Repeat steps 1 through 5 until clear water begins to drain from the radiator.